The soursop fruit, also known as the guanábana, this fruit is common in the tropical climates of Africa, South America, Southeast Asia, and the Pacific Isles. The soursop is a member of the Annonaceae family which also includes the paw paw fruit. Also referred to as the thorny custard apple, thorny mango, and thorny fruit due to its exterior appearance. It tastes like a combination of pineapple and cherry, with a creamy flavor like that of the coconut or banana. Its pulp is white, with inedible black seeds which should not be consumed due to their possible toxicity. The fruit of the soursop is used flavor ice cream, sorbets, and candy. Fruit bars made from the soursop are very popular in Venezuela. It is believed to have originated in the Philippines, from where it spread via the Manila Galleon trade route, which operated between Spain and Manila from the 1500’s to the late 1800’s. For centuries, the guanabana fruit and its leaves have been used to cure many illnesses, including stomach distress, cough, asthma, and fever. The soursop has also been used by to treat urethritis, liver problems, and leprosy. Wash the soursops under running water. Make sure to scrub, as there can be dirt that gets caught on the bumps of the skin. Once washed, peel the soursops. You can use a pairing knife to do this. Since the skin is very soft, you could even use your hands to peel the soursop. After peeling the fruit, cut it in half to remove the stem. To remove the seeds, place the pulp in a large bowl and break it up by hand. Discard the seeds. Then, put the soursop pulp, cubed coconut, cubed pineapple, leafy greens, and peeled ginger into a blender. Pulse until everything has blended together. If you'd like a thinner smoothie, feel free to add a bit of water or coconut milk, a bit at a time, until you reach your desired thickness. Alternatively, feel free to blend with some ice cubes to create bit of a thicker consistency. You can leave out the greens in this recipe for a sweeter taste, but they add powerful nutritional properties. For the cubed coconut, you can prepare your own at home, with a few simple tools (a hammer and a butter knife), or you can buy pre-cubed coconut. Usually, the latter option can be found in the frozen food section of the grocery store. In one study funded by the National Cancer Institute, fatty compounds in soursop inhibited the growth of cancer cells. According to the Memorial Sloan Kettering Center, some other compounds in guanabana also have anti-parasitic and anti-inflammatory properties. In another laboratory study, published in the Journal of Ethnopharmacology, it was demonstrated that an extract of the fruit inhibited the development of the Herpes virus. The Journal of Medicinal Chemistry also published a laboratory study which showed that soursop extracts were highly effective in killing breast cancer cells compared with traditional methods. All these studies, however, remain to be tested on human subjects. This fruit is low in calories and high in fiber with no sodium or fat while offering a wide range of phytochemical compounds unique to the soursop. Loaded with vitamin C and a host of B-complex compounds, guanabana is rich in minerals and unusual compounds such as acetogenins. Soursop contains potassium, phosphorus, magnesium, and copper, iron, zinc, and calcium. The fiber in guanabana assists in maintaining a healthy digestive system. The iron and calcium help to strengthen blood, bones, and teeth. Phosphorus combines with calcium to protect against osteoporosis. The niacin (a B vitamin) lowers bad (LDL) cholesterol. The phytochemical compounds as mentioned above show tremendous promise as anti-cancer agents. 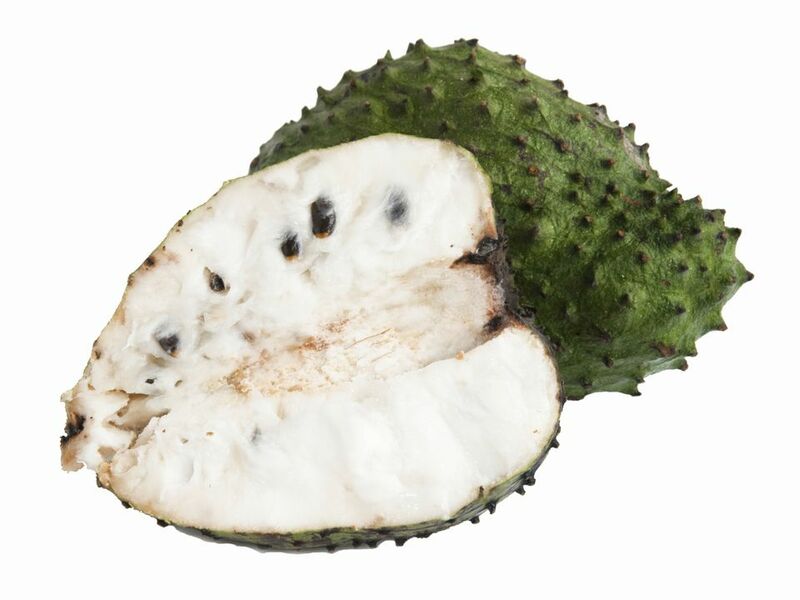 Further, soursop helps minimize muscle cramps and migraines due to its high concentration of potassium and riboflavin.